I was fortunate enough to have my mother come visit, and we had a blast! We did a little shopping, ate great food, and I even finished my chandelier (I followed a great tutorial I found online, I’ll be showing it later this week with a snippet of our foyer renovation.) It was a great weekend overall! Some of you may have caught my DIY breadboard wallpaper cabinets tutorial over at Sand and Sisal last month, but incase you missed it I will be posting the tutorial here today! And here’s a more recent photo of our kitchen. Still a little ways to go, but progress is progress, right? Our biggest issue that we had with our kitchen was our cabinets – The doors fell off almost constantly! 1) The first step is to remove your cabinet doors and hardware, and place them down on a workable surface with the outside facing up. 2) Next, measure the outside edges around your cabinet doors for each cabinet that is a different size, this is the measurement for the wood you will be cutting. 3) Cut your plywood into 2 inch wide strips (or the width of your preference) and then cut the strips to the measured dimensions you took before, mitering the edges. 4) When you are finished you may begin measuring the beadboard wallpaper to the size of your cabinet doors, using a straight edge and pencil to draw a cutting line. 6) Apply your beadboard wallpaper to the doors according the package directions. Keep an eye on your wallpaper as it is drying, so you can smooth out any bubbles along the way! 7) Using wood glue, apply your outer frame for your cabinets. 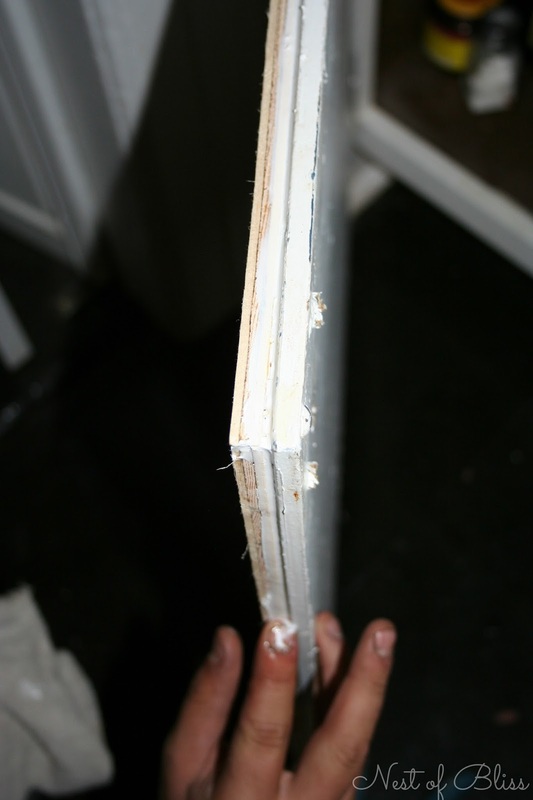 8) When this was dry, we secured a few screws from the inside for extra support to hold the frames. 9) Apply caulking to your mitered edges to help minimize cut lines, and also to the inside and outside edges where your frame meets up with your existing cabinets – this just creates a smoother transition. We dipped our fingers in water and glided them along the edges to make them smooth. After you’ve applied your coats of paint, you can choose to seal with the protective coating of your choice. Then of course, you are finished! One of the main concerns that people have about breadboard wallpaper is scuffs and scrapes to the surface. I would suggest several coats of polyurethane or a protectant of your choice to help ‘harden’ the surface! Be sure to check out our full farmhouse kitchen tour! This is such a stunning and affordable kitchen cabinet transformation! Wonderful tutorial too! Pinned it tonight! Our drawers were already that way, but if they weren’t I would just forego the paper for that area and just paint them – or create a wood boarder for around those as well if they are large enough! So far the wallpaper has held up for us since the wallpaper is scrubbable and we’ve even wiped down spills often. Also, the wood holds the paper in place so if you rub up against anything you are hitting the wood (Say if you were preparing food for example). For extra durability you could coat the paper in a protectant of your choice, or instead of wallpaper cover your cabinets in beadboard wood sheets cut to size! I’m so glad to hear they’re wipe-able! I have some leftover beadboard wallpaper from our bathroom and was planning on using it for this exact project (great minds think alike!). My only hesitation was the question of durability. Thx for sharing!! I think it all depends on the type of wallpaper. I know mine said it was water resistant for bathrooms etc, so I went by that! I would be careful if it was meant only for low moisture rooms! I’m glad you enjoy the project! Wow! What a difference! Great job. Stopping by from Daily Blog Boost. LOVE this idea! So clever! I love the look of beadboard and I had no idea there was a wallpaper to mimic it. Seriously, I might have to do this to our prefab cabinets! Definitely give it a go! I know a lot of people have used this paper for their walls and added a chair rail. It was so inexpensive too! Thank you for your comment Vanessa! I purchased our at Home Hardware (Canadian company) but I noticed that Martha Stewart had some at Home Depot! Wow! That made such an amazing difference! That’s such an excellent idea. I’m pinning and clipping to Hometalk. Thank you so much, it certainly has come a way from where it started. 😉 I’m so happy to hear you like it! Oh my goodness this is such an amazing and cost effective idea! Definitely saving this one for when I purchase a home of my own down the line. Love the country chic feeling it gives the kitchen : ) You’ve done an amazing job on the transformation! I hear you Jodie! I love it for the same reason myself. Thank you! Brandi, your cabinets and kitchen look just beautiful – you did a fabulous job! I really need to give my cabinets a little love after the holidays and this is some awesome inspiration. Thanks so much for sharing and pinning! Hope you are having a wonderful week! Fantastic! Thank you for tutorial. One of the best DYI makeovers I’ve seen. So pretty. You painted just the trim, right? Not the wallpaper? Was it hard to keep the edge where the two meet neat? Thank you so much for this tutorial!!!!! You kitchen looks amazing! May I ask where did you buy the hardware? Maira, I bought them from a store called Grampy’s Country Barn. They are heavy, antique-looking knobs and pulls which I felt went with the old farmhouse. I believe they have a FB page! Great job, Brandi! Your kitchen makeover is beautiful! I am going to share it on my facebook page. Love the beadboard wallpaper. I just put some up in my kitchen for the first time and I love it! Thank you Traci! That means so much to me… Thank you so much for sharing! OH how pretty! We added beadboard wallpaper that we found on clearance to our cabinet doors about 2 years ago. I love how it changed the entire look of the kitchen without having to pay for a major overhaul (it was have an addition built in order to have a bit more living space.. family of 5 in 1200 square feet which included closets, hallway, & bathroom footage to 1400 sq feet or overhaul the kitchen.) We opted for the addition and I’ve been redoing the kitchen on a budget, slowly as bargains become available. Your kitchen is simply incredible! Keep up the good work! I love seeing homes made beautiful on a budget!! Thank you so much for your sweet comment, Peggy! It means so much to me! Does the wall paper bead board show dings and dents over time? I looked our our local store at the beadboard wallpaper and I could cause a dent in it with my finger nail. I must not be looking at the same kind that you used. Mine could dent, yes – however it doesn’t get bumped often. I recommend for those looking for more protection to coat it in a few coats of poly to harden the surface or buy wood beadboard sheets to cut to size. No problem Reagan! I was in the same boat as you and am so happy with how it turned out! Wow! I love it! I have a tall freestanding cabinet with the “standard” recessed/beveled design found on so many inexpensive cabinet doors. Do you have any suggestions how I might be able to use beadboard paper to transform it? Looks wonderful Brandi! Looking to do the same in my kitchen. What kind of plywood did you use? Birch? Pine? Thanks! I’m not too sure what we used – I would assume pine. But I will say if I ever use this technique again I will go with the smooth plywood boards at Home Depot as they aren’t rough. this truly is my inspiration for transforming our kitchen… what did you do to your drawer fronts? gorgeous! simply gorgeous!!! Did you prime the doors before adhering the wallpaper to them? Ours had paint on them but my husband sanded it all off. Did you eliminate the original doors completely and just use the plywood? If the cabinet doors are in good shape could you just use original doors and wallpaper over those? Your kitchen turned out beautiful!! We are thinking of replacing our kitchen doors as well. But before we do this I wanted to see how well yours have held up? Any warping? Anything you would do differently? Thank you! If I were to do it again for a place I was keeping longer-term, then I would probably attach real beadboard sheets of wood overtop for long term durability. It would cost a little more, but it would be the best investment overall. This maybe a dumb question, but do you paint the beadboard paper when you paint the wood trim? Or do you just paint the trim? Do you paint the wood then glue it, or glue it then paint. I’m just not sure if I should paint the paper too! I painted the paper as well when I was finished. What is the brand of the Wallpaper and where did you get it? I did this project on a small studio that had flat laminate doors. We ran into one problem our cabinets were mounted tight against one wall and the added depth did not allow enough clearance for the door to fully open. Thank goodness I was able to add a shim behind the cabinet hinge and there was enough center gap, between the doors, to allow for this adjustment. Project is stunning and saved me so much money. Oh that is so wonderful to hear Jo! Let me know how they hold up – I know people are concerned about how soft these textured wallpapers are! I found the Allen & Roth wallpaper, per pasted and paintable, for under $20 at Lowes. Ok I’m gonna try this with my outdated cabinets in my kitchen… So the question I have is what is the proper technique to address the open spaces on the cabinets itself? My are a brown color & I want to do the white… So can I just paint the rest of the cabinet space, like the sides & spaces in between with the white paint? Do I need to sand? I have no idea about this kind of stuff but I feel like I can take this on once I get this question answered. Looks so awesome & I cannot afford new ones or really to hire someone. Thanks in advance! Honestly, I just primed and painted the inside! Any words of advice before we start or any tips?? I got everything you listed and can’t wait to start! Awesome Becki, just follow the tutorial and you will do fine. I would love to see the end result when you are done! Have fun! Considering doing this. How has it held up over the years? It has held up pretty good. But you do need to be cautious around it and avoid hitting it with anything hard. You have some genuine creativity in you sweetie!! I am so inspired. I came looking for updates on your spray paint kitchen counters but I can’t find the original post? I came via Remodelaholic. I have a couple questions, if you don’t mind answering? You said to clean with TSP first, then sand, then clean. The second cleaning, is it with TSP again? Or water? Also, do you know how many cans you used? It would appear you have about 12′ by 36″ countertop space, total? I’m just guessing! lol. How well have they stayed for you? How did you apply the poly? Sigh. I soooo bad would like to freshen my kitchen. I’ve been here for 19 years and it needed done when I moved in! So yeah, pretty sad. Thanks for your time Brandi! Do you think you could add a distressed effect to cabinets done this way? If so, what would you recommend? 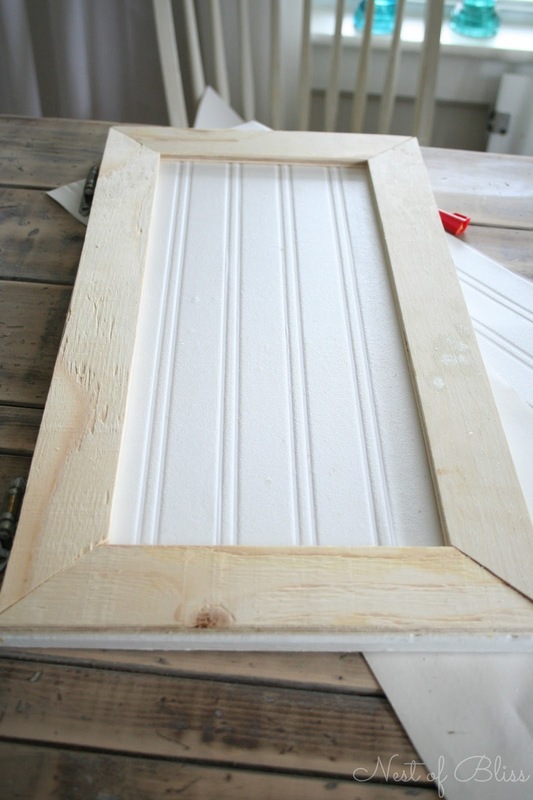 Hi Hannah, I am not sure if it could be done or not, but if I was going to try to distress the bead board, what I might try to do is to get some craft stain and rub that on and wipe it off with a damp cloth. I think you would have to experiment until you get a technique that you like. Hope that helps! I absolutely love this!! I am in the process of painting my kitchen cabinets at our house on the lake. I was thinking about doing the beadboard and framing with thin pieces of trim but my doors are scalped and it would require a lot of caulk…not sure how that would look. Still undecided. After seeing how gorgeous your kitchen looks, I just may be doing it after all. Thanks for the inspiration!! I was wondering would a different type of textured wallpaper look ok? We also are on an extremely tight budget and have some different design of wallpaper laying around?